Lay bacon strips onto a baking sheet and bake in the oven for 8 minutes only. Remove from heat and use kitchen shears to cut the bacon in half. Meanwhile add olive oil to a medium saucepan over medium-high heat. Add onion and garlic and a pinch of salt and pepper. Cook for 2 minutes. Add the fresh pineapple and orange juice and simmer until the liquid has reduced by half. Stirring occasionally. Add ginger and lemon juice. Remove from heat. Taste for seasoning. Place one chunk of pineapple onto a skewer. Wrap a piece of bacon around a shrimp and skewer this on next to the pineapple. Repeat this process until all the shrimp and pineapple are skewered. 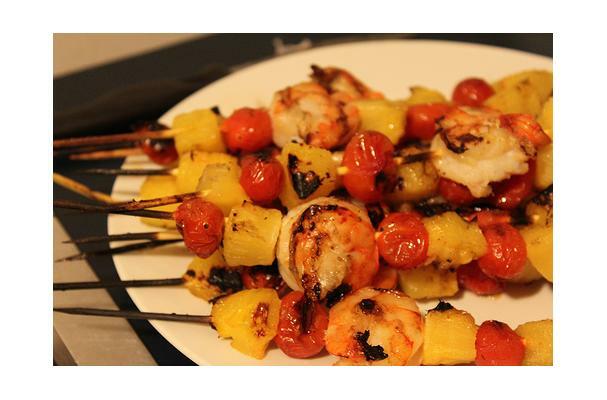 Place the skewers onto a baking sheet and bake for 6-10 minutes, watching carefully for the shrimp to be done. Remove from heat and drizzle or brush the sauce onto the skewers.